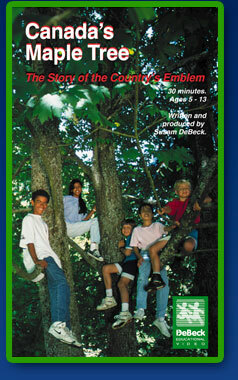 An excellent resource for Canadian studies programs in elementary school, this video crosses Canada to find what maple trees grow in different regions and how the maple leaf became Canada's emblem. A map of Canada introduces each of the provinces through the seasons: sugaring off in Quebec, spring blossoms in British Columbia, summer on the prairies with the Manitoba maple, as well as red and sugar maples on the Atlantic. The journey ends with the colorful leaves of fall in Ontario. Canada's Maple Tree includes the singing of O Canada, a sketch of the Fathers of Confederation, Canada Day, and George Stanley telling how his design became that of Canada's maple leaf flag. "Creativity and careful thought infuse this energetic program, which melds botany and geography with nuggets of history, literature and craft activities." Download and install the current Adobe Flash plug-in, and return back to this page. © Copyright 2008 DeBeck Educational Video, all rights reserved. Design by Random Ink.